Today, we are experiencing a turbulent job market that is unprecedented. Not knowing how to find a job in this market puts a job seeker at an incredible disadvantage. Most job seekers begin by updating their resume and e-mailing it out. These job seekers miss out on the most important steps and by doing so are sabotaging their own search efforts. 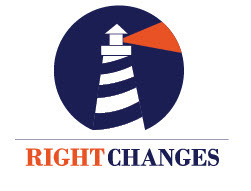 RightChanges offers affordable job search coaching solutions. Job seekers learn what it takes to find and land that job in this economic downturn and high unemployment market. With the grace of God, job seekers who used the entire RightChanges approach are employed in jobs they wanted. Click here to find out more about the RightChanges solutions. "The Affordable & Successful Job Search Coach"
The big outplacement firms charge up to $10,000+ per person. Other coaches focus on executive management and still charge huge fees or hourly rates that add up quickly. RightChanges provides the affordable job search coaching solutions for every job seeker. Our clients' successes demonstrate our value. Using a proven, successful program, RightChanges helps job seekers develop effective search skills, increase their confidence, identify and leverage their competitive edge, and tap into the hidden job market by knowing and doing what it takes to find and land that next job. Click here for a checklist to use when comparing job search coaches. We can help. RightChanges offers solutions to meet your individual needs. Act now. The job market is not getting any easier and your competition is already out there.